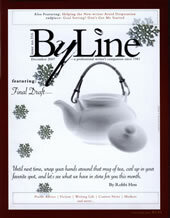 This article originally appeared in the May 2008 issue of Byline Magazine. Completing a cohesive, book-length manuscript is a daunting task, but at least the work involved is something all writers understand. What to do with the manuscript once it’s completed, however, remains a mystery to far too many aspiring authors. It need not be so. Before you contact a publisher, it is imperative that you ask yourself an all-important question: what do you hope to achieve through publication? Is your goal to get published with a recognizable imprint and to see your book on the shelves of bookstores across the country? Is your goal to collect your poems in a professional-quality keepsake that you can share with family and friends? Whatever your goal, it is important that you are brutally honest with yourself, because these two ends of the spectrum, along with everything else in between, possess very different requirements. There are three routes you can take to get your book into print: (1) traditional publishing, (2) self-publishing, and (3) subsidy publishing. When advances in computer and printer technology erased the manuscript preparation difficulties earlier generations faced, publishers found themselves swamped with unsolicited submissions. Instead of hiring more readers to wade through the mountainous slush pile, they relegated the task to literary agents. Since agents only got paid a percentage of their clients’ royalties, publishers figured there was no need to tangle with the slush pile themselves. Now, all the major houses adhere to a strict policy of refusing to read anything that is “unagented.” If you want to be published by a major New York City publisher—Random House, Simon & Schuster, and so on—then you will first need to find a literary agent willing to represent you. Literary agents are the first gatekeepers on the path to publication with the major houses, screening hopeful writers in search of marketable authors. Once a traditional press expresses interest in your book, they will offer a contract that specifies the particular rights they wish to purchase from you. You will still “own” your book, but they will own the right to publish it. Once you sign with them, you will work with a specific editor at their publishing house and go through several sessions of back-and-forth editing until the two of you agree on the final format. You may have to deal with other editors, such as copy editors and fact checkers, along the way. You will also have a specific publicist assigned to your book, and that person will usually try to set up a few appearances in local bookstores and any “platform” venues where you have a built-in audience. Do not expect to be sent on a ten-city tour unless there is significant buzz accompanying your book. The major houses have many books released in any particular season, and the ones they put their weight behind are the ones that already have some sort of buzz. The book will be scheduled for release at a time when their publicity department deems best. The average time from acceptance of your manuscript to arrival of your book on the shelves is about a year-and-a-half. In most aspects, small or regional presses are just like their big brothers in New York: they pay authors through a royalty agreement to publish, catalogue, copyright, market, and deliver your work to an interested reading public. There are, however, four key ingredients where small and large presses differ: (1) advances, (2) royalty percentages, (3) print runs, and (4) distribution. Few small presses offer advances; they simply don’t have the budget to do this. However, it is important to remember that an advance is exactly that: an advance payment against royalties on your book. If you are paid a $30,000 advance on a book, then you don’t earn any royalties on sales until your take passes the $30,000 mark; then you earn a royalty at the amount agreed upon in your contract. Since small presses typically don’t offer advances (or offer small advances as an honorarium), you start earning a royalty with your first sale. And, since the small presses don’t tie up capital on large advances that they have to recoup, they are often able to give their authors larger royalty payments. A big publisher pays high percentages to its major authors but will typically offer less than 15%, sometimes much lower, to a new talent. A small press will sometimes go as high as 50%. Since small presses put much more of the marketing process on your shoulders, they have to make it worth your while to get out there and sell your book. Large presses also want you to be an active partner in selling your book, but they have specialists and funds to mount publicity campaigns far beyond what a small press can, so the demands on individual authors are less. Major presses also boast a vast distribution network that reaches out into every bookstore in the country, as well as many convenience stores and supermarkets. Books published through a regional press will usually get good exposure in the author’s hometown and the region surrounding the press itself. Anyone living outside a small press’s region will usually have to request the book through a local bookstore, order it from an online bookstore like Amazon.com, or order it directly from the publisher. Often small presses will also seek exposure through lesser traveled venues, such as galleries and specialty stores that are somehow associated with the book’s subject matter. When a major publishing house creates a book, it does so using large machinery that prints and binds books at high speed. The machines are expensive to run so they print in volume to make the time spent on the machine worthwhile. A small print run means the publisher won’t earn back the expense of down time and set up between different print runs. Essentially, they have to guess beforehand how many books will sell. When they don’t reach that number through actual sales, they lose money. Many small presses get around this risk by using Print-On-Demand technology, or POD, to create their books. POD machinery can print a much smaller run of books than can be done on the major presses. The books are loaded digitally into the POD computers and printed out in basically the same manner as printing out pages from different documents without pause on your laser printer at home. After one book’s run has been completed, whether it was a run of a thousand books or a single copy, the next book in line can be printed immediately afterwards. This technology allows small presses to order smaller print runs with less overages, thus keeping their profit margin from running out of control and allowing them to carry multiple titles without warehousing huge stockpiles. If your goal is to showcase your writing in a beautifully bound book that you can share with family and friends, self-publishing is an option you should consider. You do not have to go through a lengthy screening process and you will have no demands of marketing placed upon you. For those who are great salesmen, this option affords greater profit opportunity, since all profits belong to the author alone. The “publisher,” in this case, is actually just a “printer.” They will print whatever you send them as long as you pay for it. There used to be a time when “self-published” meant someone cranking out handbill copies on a mimeograph machine in his basement. Now, the quality of most self-published books stands up to those produced in New York City. There are, of course, exceptions, which is why you should always be familiar with previous titles a press has published before signing a contract with them. Order a sample copy, hold it in your hand, and ask yourself if you’d be proud to share that with friends if your name was on the cover. “Print on Demand” should not be confused with “self-publishing” (also known as vanity presses), although most self-published books do use POD technology. Some self-publishing presses create books completely on location, though far more contract out with a printer to actually print and bind the books. Some will also offer fulfillment services, such as stocking printed copies of your book, taking customer orders, and shipping the book when ordered. Every additional service comes with a price tag. Since there are no restrictions or screening process with self-published books, they are sometimes frowned upon by the literary public and bookstores. This truly is a shame, because many excellent self-published books don’t get a fair shake. Larger bookstores often refuse to stock self-published books, partly due to limited shelf space but also because of their habitual business practices. When a bookstore orders from a major publisher, the books are delivered through a book distributor like Ingrams or Baker & Taylor, with the publisher paying the shipping and handling costs going both ways. A self-published author won’t have a distributor and has to either hand carry books to the store or send them through the mail. The self-published author will also have to fill out a consignment agreement or some other sort of contract when dropping off the books, whereas traditional publishers will already have their deals set in place. The complicated process for stocking books by self-published authors makes most chain bookstores shy away from them. Independent bookstores have to jump through the same hoops as chain stores, but they don’t have to deal with corporate policies set up to favor the major publishers. They can choose to carry any book they like based solely on its merit. Independent bookstores are the self-published author’s best friend, and any marketing tour should be peppered with independents. A subsidy publisher possesses a blend of attributes from both the small traditional publishers and the self-publishers. Like traditional publishers, subsidy publishers use a submission process to screen submissions. Yet, once they accept a submission, they ask the writer to foot the bill to print the book. Once the bill is paid, they again revert to the role of a traditional publisher, editing, marketing, and distributing the book under their own imprint and paying the author a royalty for all sales. This type of publisher is essentially forming a partnership with the author, agreeing to back a book it believes in if the author is willing to absorb some of the up-front costs. The main benefit of taking this route is that you gain the credibility and distribution capabilities of a known imprint. Subsidy publishers also tend to pay more individual attention to their authors and put significant effort into the marketing campaign, since they need book sales to make a profit. The capital you pay upfront merely covers the cost of creating the book. By having you pay for the printing, they limit their risk and have more freedom to accept work that interests them. Once you’ve found the “type” of publisher that’s right for you, you can use listings from The Writer’s Market or a similar compendium to find one that is a good fit for your book. You can also browse the bookshelves to find publishers of books similar in scope to your manuscript and search for them online. Their websites will list submission guidelines describing how to contact them. Don’t veer from these guidelines. One publisher’s preference might be another publisher’s pet peeve. Some prefer manuscripts submitted via post and others accept work only via email. Some accept simultaneous submissions and others demand a period of exclusivity. Reading their guidelines before submitting will save your postage, paper, and sanity. Once you submit your words to a publisher, they are out of your hands. You’ve done the hard part— actually writing a book-length manuscript!—but the journey is only halfway over. You’ve already spent months or years shaping your text; why not expend just a fraction of that effort choosing the right publisher for you? What you do in these final few steps on the path to publication will create the lasting impression that readers will have of your entire journey. Step wisely.